August 2011 – Oh Remy! 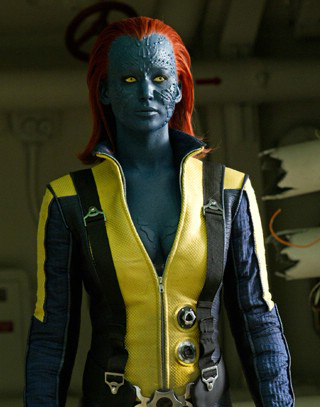 Why’s Mystique walking in your..? 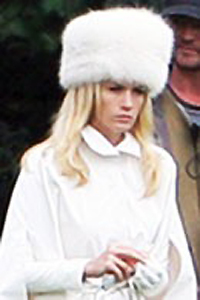 Emma Frost wearing the most clothes you can find in the comics. 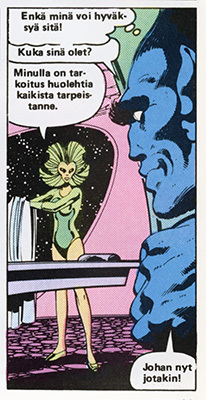 In Ryhmä-X 8/1985 the Dark Phoenix Saga finally comes to its end. Jean Grey, the young telepath, who sacrificed herself to save her friends and returned to life as Phoenix. After meeting Jason Wyngarde/Mastermind she began to find out more about her almost unlimited powers, growing ever more powerful and unstable. The last straw was when she witnessed the love of her life Scott/Cyclops die in a vision created by Wynegarde. The last locks in her mind cracked open, letting the Phoenix Force loose. Except this time she emerged as the Dark Phoenix, the destroyer of worlds, the manifestation of hatred and anger. In her rage she destroyed a whole solar system, attacked a Shi’ar battleship, but after battling her friends, the X-Men, she was returned back to her normal self. Now it’s time to pay for what she did. The X-Men are kidnapped by the Shi’ar, who want to destroy the Dark Phoenix, which in turn would mean killing Jean in whom the Phoenix Force resides in. Since it seems Jean is back to her normal self the rest of the X-Men including Xavier feel this to be an unjust action and Xavier makes an “Arin’nn Haelar” challenge which means the X-Men will fight over the life of Jean. The Shi’ar have no option but to accept the challenge and the X-Men are taken to their quarters to prepare for the battle for the following day. 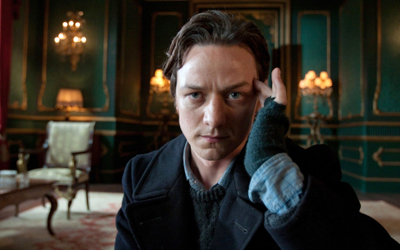 During the preparations every X-Man is given a chance to think about his/her relationship with Jean. The most touching ones are those of Jean herself and Wolverine. Being the badass rebel of the team with rough edges, Wolverine is still the most sensitive and deep person in the team. He takes a shower and thinks about his feelings for Jean and how he is going to stand next to Jean no matter what. Jean asks her servant to bring her her old outfit which just emphasizes the fact that she and the Phoenix Force are different entities and at this moment she is but a Jean Grey, the Marvel Girl of the past. It’s going to be a battle for her life and yet at the same time it’s a battle to save the universe from the threat of Phoenix. Wolverine takes a shower and thinks about his relationship with Jean. The following morning the X-Men are transported to the battleground. Ironically the person who made the challenge, Xavier, is sitting safely inside the Shi’ar headquarters from where he can watch the battle. In the battlefield things do not go as smoothly and comfortably. The X-Men are very soon defeated, except for Jean and Scott. Suddenly Jean starts to feel the pressure and she senses how Phoenix is trying to set herself free once again. 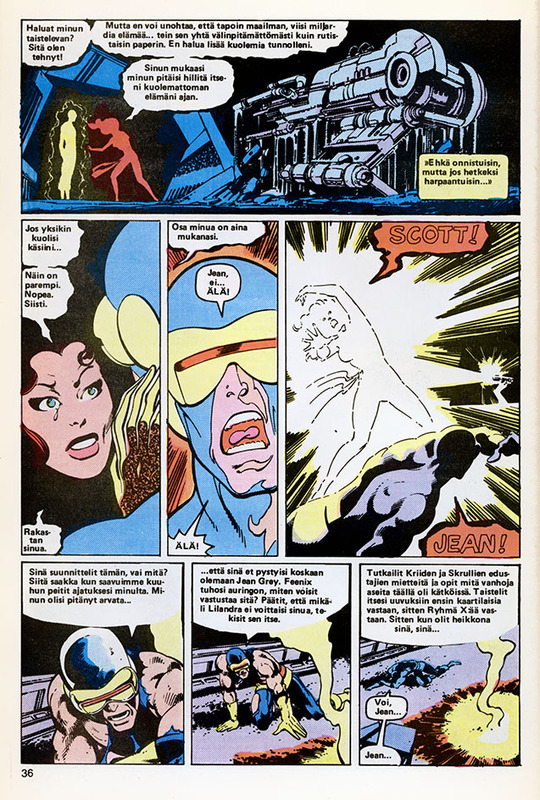 Jean takes Scott into the tunnels and captures him with her powers. She says her goodbyes a to Scott, as a hidden defense weapon rises from the back of the tunnel and shoots her dead. She’s gone. Realising her Phoenic Force was getting loose once again, she decides to sacrife herself in order to safe the universe from the wrath of Phoenix. Jean kills herself in order to save the world from Dark Phoenix. At Jean’s funeral Scott lets the others know he’s going to leave the group. Without Jean he feels there is no reason for him to stay. Spider-Woman starts her career as a private eye. Notice the Egyptian statue of Horus on the shelf. 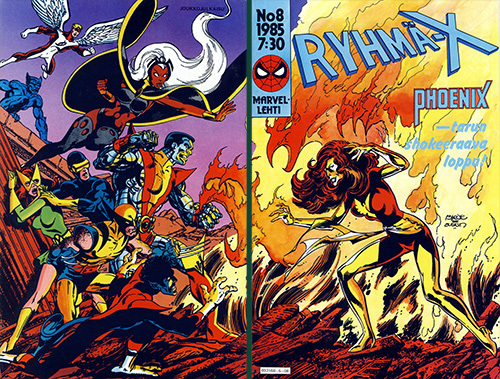 The magazine also contains another story, featuring Spider-Woman. In the story she goes to see Nick Fury, the head of S.H.I.E.L.D. asking for him to sign her a license to work as a private eye. In the following two pages her whole background story is told. How she found out about her powers, joined HYDRA, and finally when ordered to assassinate Fury, decides to leave the group and join S.H.I.E.L.D. Nick Fury gives her the license and leaves the name for her to fill in herself. Doesn’t even he know who she really is? Quite surprising. I would have thought he has extensive knowledge on all the superheroes on Earth. In the last two panels she’s shown hanging her license on the wall of her office. 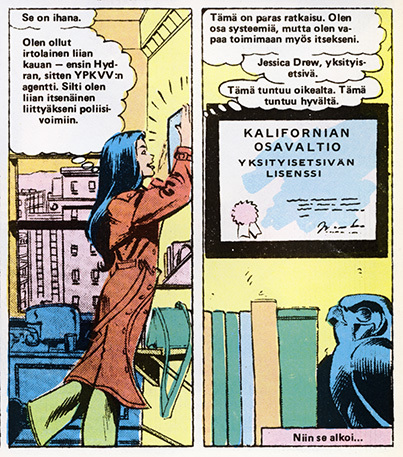 I hope this will not be the last we hear of her in the Finnish Marvel magazines. And should it be, at least they have published a small softcover book full of her adventures in Ihmesarja #9. Whenever I’m at a funeral I either cry my eyes out (happened once at my grandma’s funeral) or I can’t stop laughing (every other time). I’m sure it must be something to do with nerves. All of a sudden many people sobbing around you is the funniest thing in the world. The priest’s voice is hilarious. Old people sing with high pitched voices. And by the grave when they lower the coffin I always start spotting the weirdest things. My favourite funeral still being one which included all the above and finally by the grave, to my utmost horror and shock, I noticed a real human jawbone with a few teeth sticking from it lying on the ground right next to the family grave. When people took turns to lay their flowers on the grave they kept stumbling on the jawbone and for the whole time I just stared at the bone being kicked and trampled on and thought if I should go and pick it up and take it elsewhere or just hope nobody else noticed it. That part wasn’t exactly funny at the moment it happened, but it made an unforgettable story to share with all friends. This issue of Ryhmä-X was the most touching one so far and you’d have to be blind not to sense the dark undertones of the whole issue. 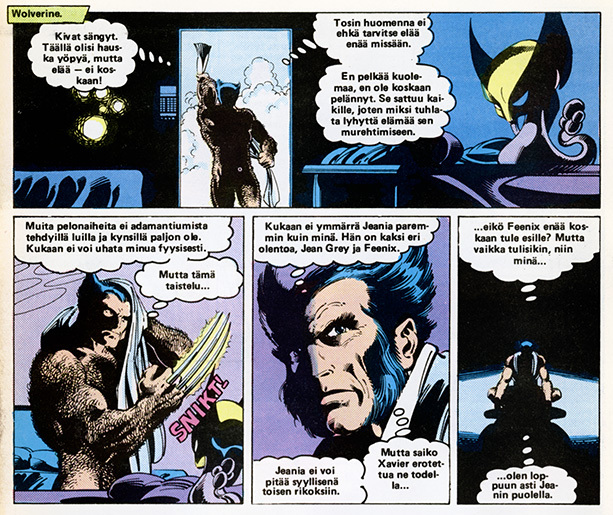 Already in the last issue, Ryhmä-X 7/1985, Jean had begged Wolverine to kill her in order to save everyone else. Every member of the X-Men reminesces their past with Jean and are willing to fight to save her life no matter what she had done as Dark Phoenix. 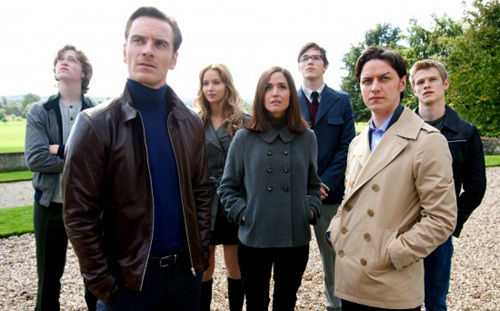 They know Jean would not harm anybody, but Dark Phoenix will. 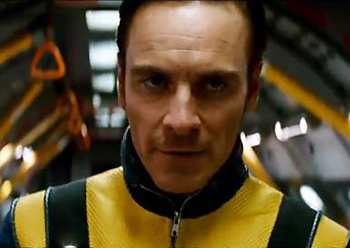 Is it ok to sacrifice an innocent young woman to stop Dark Phoenix? It must have been the dark undertones and the feeling of impending doom which made my brain turn to funeral mode. I tried to keep serious and concentrate on the story but I could only see those little details. And I suppose there is no excuse for me, I’m just one dirty mind trapped inside a female body, but quite soon everything began to look very suggestive and outright lewd. What's that?! I hope it's only a printing error. Please, let it be a printing error! Very soon Hank/Beast meets an alien maid, who lets him know she’ll fulfill his every need. I think she ment something like change the sheets or bring raktajino, but looking at Hank’s reaction he interpretes the message quite differently. Beast and a peculiar offer. Beast: "Who are you?" Alien: "I'm meant to take care of all your needs." I think she meant she'll bring him food and change the sheets, but I think Beast understood it wrong: "Well, oh my!" Just look at his face. And last but not least, in the following battle the Shi’ar fighter Gladiator beats down Colossus – or at least out of the two, he’s the one who stays unharmed when the roof collapses on them. Xavier follows the fight from a screen back at the Shi’ar headquarters and has to witness Gladiator pulling Colossus out of the rubble. Although that’s not the only thing he’s doing. Xavier apparently can’t do anything else except repeat “no, no, no”, over and over again. 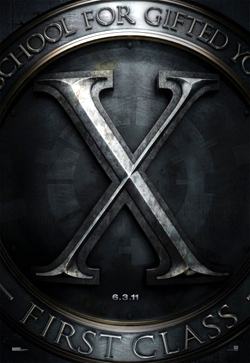 Xavier watches the X-Men and thinks: 1) "No." 2) "NO. NO. NO. NO. NO." 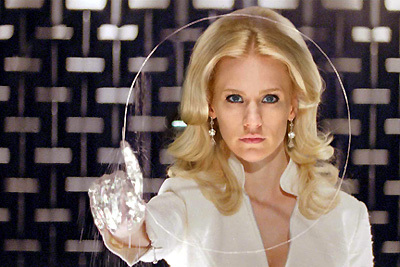 3) "Oh, my X-Men. I thought you might have had a chance. I could not have believed it would end like this. Please forgive me." I know how you feel, Xavier. I also had hard time to believe my eyes when I saw them. And so dies Jean, one of the original X-Men, and all I can do is giggle at my infantile, ambiguous sense of humour. Sorry, Jean. No hard feelings, eh?